Logistics, demand, truck/rail shortages, the weather—and Trump—all are contributing. 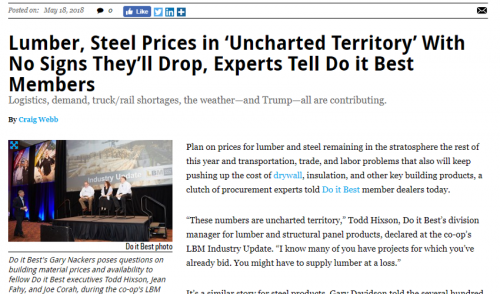 Share "Lumber, Steel Prices in ‘Uncharted Territory’ With No Signs They’ll Drop, Experts Tell Do it Best Members"
Plan on prices for lumber and steel remaining in the stratosphere the rest of this year and transportation, trade, and labor problems that also will keep pushing up the cost of drywall, insulation, and other key building products, a clutch of procurement experts told Do it Best member dealers today. Lumber’s upward warp has been a fact of life for quite a while; Random Lengths’average composite price for framing lumber rose 19.4% in 2017, and as of May 18 its index price of $568 was 39% above where it stood one year ago. "Buyers and sellers [were] acknowledging that this run was unprecedented," Random Lengths reported. The National Association of Home Builders estimated May 11 that lumber price hikes have added $7,000 to the price of a typical home in the past year. You can cite tariffs already in effect for softwood lumber imports from Canada as one reason why lumber prices are elevated, and threatened tariffs on steel influencing prices for rebar and other products. But Hixson and other speakers at the Do it Best event added several other factors. Truckers’ freight rates are rising because carriers are stretched three ways, said Howard Moser of Freight Management Services, a company that works with Do it Best. The first reason is demand: there’s about 7% more volume of goods being carried by trucks today than at this point last year, he said. Second is the enforcement of electronic log tracking devices that took effect this spring. “Right now we’re seeing an 8% decline in productivity as a result of electronic logs,” Moser said. It’s not just trucks that are challenged. A cold winter in British Columbia (the source of much of the softwood lumber that the U.S. imports) forced Canada’s rail carriers to shorten the lengths of their trains. “Now there’s a stranglehold on the amount of product coming from Canada,” Hixson said. “... We’ve got some reload [centers] that can’t get products as quick.” One result, he said, is that Southern yellow pine is getting shipped to markets as far west as Nebraska. In other cases, rising customer demand is putting a floor under prices. Jean Fahy, a Do it Best division manager for building material sales, noted that a January price increase for drywall has stuck, and odds are that a second increase planned for July will stick as well. “Our manufacturers are telling us that supply and demand are equally, so any blip is going to affect pricing and lead times,” she said. As for insulation, Joe Corah, a Do it Best division manager in purchasing, said a few manufacturers have reached maximum production capacity. “We’re going to see supply tightness this summer on fiberglass,” he said, “and as a result we’ll see some price increases as well."